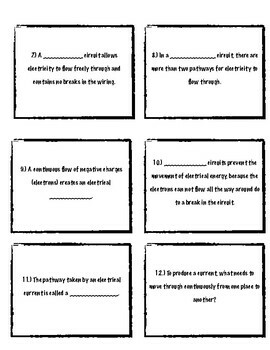 This is a great activity I use as a review tool with my students before their electrical unit. 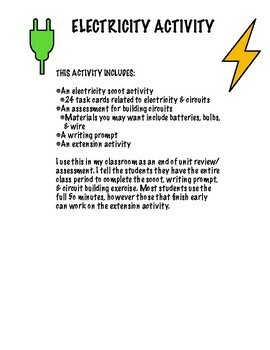 I allow them to have the entire 50 min class period to do the following tasks: a 24 questions scoot (questions are posted along the walls of my classroom), a writing prompt, & build/draw 4 different circuits. 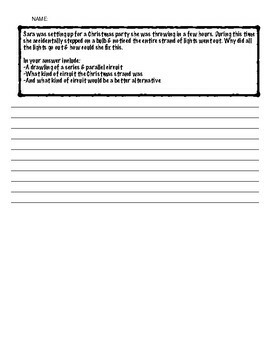 Most students take the entire time to complete these activities, however I have included an extension activity for those who finish early. Materials that would be helpful to have in the classroom include: wire, batteries, & small bulbs for building circuits.